At the market, we learned all about lake sediment cores and what they can tell us about the climate, geological, and land-use history of lakes and the surrounding areas. We also were able to take our own lake sediment cored from “Minnesota’s smallest lake”! This past Saturday (June 11th) we got to teach market visitors about bees and their important relationship with flowering plants. By gathering food from many flowers, bees provide pollination services. They carry pollen from one flower to another so that the plant can produce more plants and we humans can harvest fruit. We brought pinned bees and wasps along with close-up photos of branched bee hairs with pollen on them to show people why bees are exceptionally good at carrying pollen from one flower to another. Kids also got to make their own pollinators out of pipe cleaners (see photo below) and use them to move artificial pollen (flour) from one artificial flower (cup) to another. It was fun to see all the fuzzy, colorful pollinators that they designed! Some kids wanted to make pipe cleaner flowers too so Mohamed, Grace, Jason, and James worked out a method (see flower on the observation hive in the photo below). Also, we discovered that pipe cleaners and pom-poms make great antennae, which bees need to taste pollen/nectar and communicate with each other (see James’ antennae below). We wanted to give visitors a feel for how diverse bees are. There are over 20,000 species of bees worldwide and over 400 species in Minnesota alone . They have very different lifestyles, living alone or in groups, making nests in stems or underground, and using lots of different methods for carrying pollen back to their young. They also vary tremendously in size (see photo of the pinned bees below). We especially wanted to give people concrete steps that they can take to help bees. Lots of people asked about making artificial nests for stem-nesting bees and took our “Plants for Minnesota Bees” handout . A few even came back to show us the bee-friendly plants that they bought at the market! We had a bee veil that kids could try on, and beekeeping equipment, including a smoker and hive tool, for them to touch (see photo below). Our biggest draw was the glass-walled observation hive filled with honey bees. Everyone wanted to find the queen! She kept challenging us by moving around and hiding behind workers on the glass. Our thanks go to the nearby vendors that gave us ice for our bees. By 1 pm it was almost 100°F! We also had goldenrod and basswood honey for people to taste and compare. Although some people loved the strong, spicy goldenrod taste, most people preferred the basswood honey’s flavor. Honey bees make honey from nectar by concentrating it down to 20% water or less and using enzymes to convert the sucrose sugar in nectar into the glucose and fructose sugars of honey. However, flowers control the specific flavor of the resulting honey by adding their own unique blend of chemicals to their nectar. Yay for biodiversity! Atoms, Colors, and changes in our Chemical world! This past Saturday (June 4th) we were able to explore Chemistry at Market Science. Our event lived up to its name of “Atoms, Colors, and Changes in Our Chemical World!” and we explored all three in five different activities. The first activity was centered on a color change caused by adding dry ice to water that contained a pH indicator. The dissolved CO2 (dry ice is solid CO2) formed carbonic acid and lowered the pH of the water – a reaction that we could see by color change! This is the same process that occurs when there is an increase in atmospheric CO2, which is a leading cause of ocean acidification. The second activity helped us see two other signs of a chemical reaction and also explained some of the ecological effects of ocean acidification. In this activity we mixed clear solutions of Na2CO3 with CaCl2 and caused the precipitation of CaCO3 as a white solid – another sign of a chemical reaction! CaCO3 is the main component of clam shells and coral and these structures are biosynthesized by a similar albeit more complex process. The CaCO3 is not always stable though. As we saw by adding citric acid, the CaCO3 dissolves in acidic solutions and then bubbles form! Bubbles are gas evolution and are a third sign of a chemical reaction. This is essentially the same reaction (sped up) that causes clams and coral to struggle to form shells in an acidified ocean. Our third activity showed how chemistry can be handy to know about with everyday experiences. The activity focused on cleaning pennies with a little bit of science. While participants struggled to clean their penny in clean water or in soapy water, exposure to some citric acid polished it right up by dissolving the outer layer of copper oxide. See chemistry can be useful. The fourth activity asked participants to think about what we are breathing – air. As it turns out air is a gas and gases have special properties. We explored some of those such as the relationship between volume and pressure, moles of gas, and temperature. The last was the most dramatic since we shrunk the balloons in liquid nitrogen and then let them warm up in front of us. While no extra gas was added, they got a lot bigger! The last activity was perhaps the most popular – making SLIME! After all slime is cool. Even though the slime was a lot of fun we were also able to explain what the cross linking of polymers can do to its physical properties. I think we had a great time at the market having fun with chemistry. I hope everyone can enjoy some chemistry this week and we hope to be back again! Our May 14th session at the Midtown Farmers Market was focused on diversity in the tropics. It was a fairly cold day (44F and record low for that day in Minneapolis) so we spent time imagining the warm tropics! Did you know that estimated 50-90% of all the Earth’s plant and animal species in the tropics? Many researchers at the University of Minnesota and elsewhere are working to understand why this is and how this will change with changing climate (https://tropicaldryforest.wordpress.com/). Everyone was excited to see the preserved insects, amphibians, reptiles, and plants from the collections borrowed from the Bell Museum of Natural History and the CBS Conservatory at the University of Minnesota. 20% of the world’s oxygen is produced by trees in the Amazon rainforest — how would this change with deforestation? Many tropical trees don’t form rings because there are not distinct freeze and thaw cycles in many tropical ecosystems. Take a look at this picture, which do you think is not from the tropics? Some of these images look really similar to temperate forests in Minnesota, but the tropics are not only full of dark and dense rainforests, and white sand beaches, like those shown in the movies. The tropics are incredibly diverse, and you can find an incredible amount of species and landscapes there. We love working in the tropics so much because if you look hard enough you can find something new everyday. If you haven’t already make sure to visit, and if you have been, make sure to go again and see something new! For most species, it’s not good enough simply to make babies. In order for a species to spread their genes, those offspring need to travel. Nature has evolved some remarkable mechanisms for distributing the next generation to new locations. Most animals can simply transport themselves to a new home. Bacteria can hitch rides on hosts, in soil, or along waterways. Plants spread themselves around using seeds which can fly in the breeze, float downriver, or seduce a multitude of creatures (including us) to do the heavy lifting for them- carrying their fruits to every corner of the globe. It’s just as important to get around if you happen to be a fungus, and like plants, fungi employ some amazing ways to ensure their offspring get to see the world. Turn over a mushroom cap and you might find any number of beautiful textures- knife like true gills such as those found in Agaricus bisporus (the common grocery store mushroom), false gills (like those found on Chanterelles, which look like true gills that have melted in the heat), pores (found on many bracket fungi) or teeth (such as those found on hedgehog mushrooms). These structures may look different, but they all serve the same purpose- to house and distribute tiny fungal spores. Spores are the fungal equivalent of seeds, and these varied structures are indicative of the many strategies that fungi employ to get around. We call all these different structures ‘spore bearing surfaces’ and this week at the market, we set out to investigate why mushrooms make them. 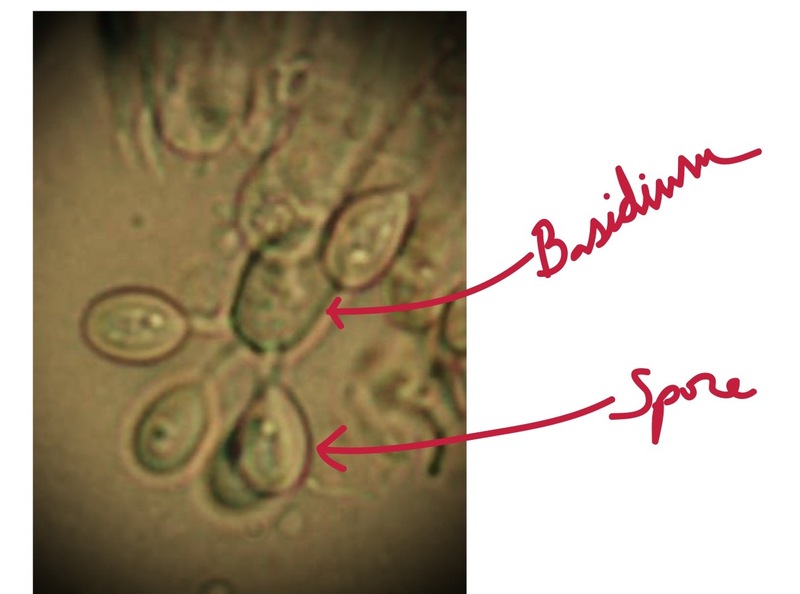 When you slice off a mushroom’s gill section and look at it under a microscope, you will see 4 tiny spores suspended on a structure known as a ‘basidium’ (plural: basidia). The gills support these basidia and hold them at a very specific spacing. The little spores are ejected from the basidia with tremendous velocity, but are halted almost immediately when their small size slams against the viscous air. Then they drop, straight down, in a flight path that clears the adjacent basidia while maximizing the number of spores that can fit in a given area of the gill. After the spores have fallen clear of the cap, they are perfectly positioned to hitch a ride on tiny air currents, which insure they land at the greatest distance possible from the parent mushroom. 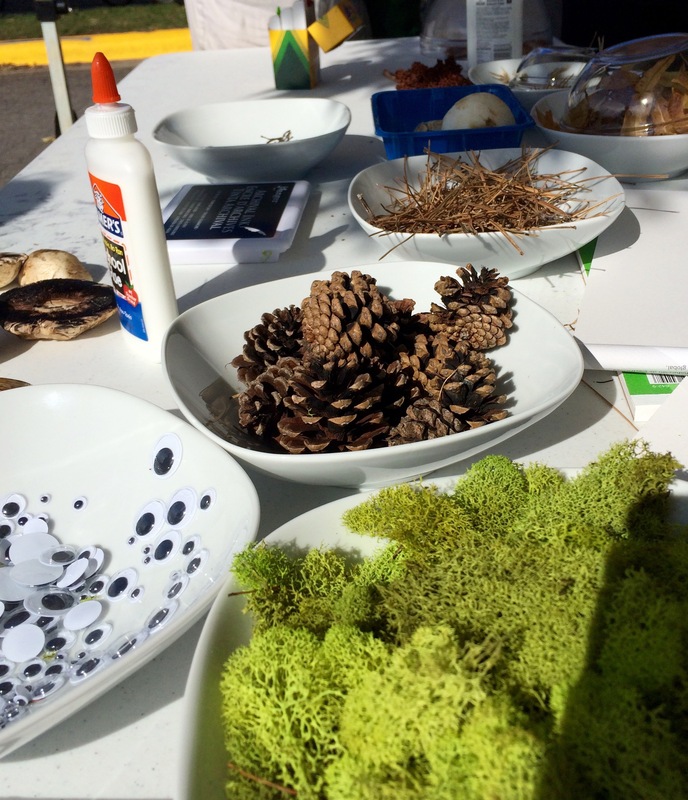 At the market this week, we explored mushroom biology by making gill stamp critters. After taking a look at some diverse examples of fungal spore bearing surfaces under a dissecting microscope, our kid-scientists carefully peeled back the mushroom cap margin to expose the gills and used the gill surface as a stamp. The stamps preserved the important gill spacing of the mushrooms and provided a print to create mushroom critters! 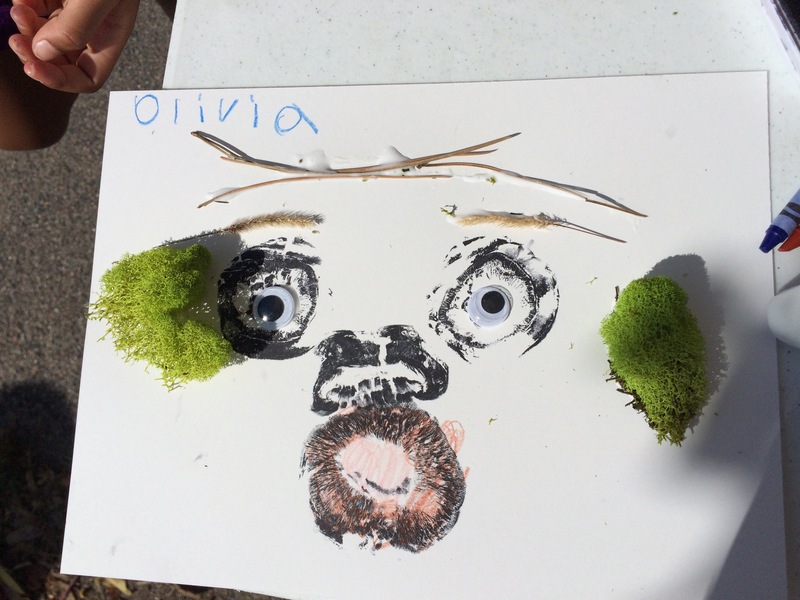 Our scientists then glued on googley-eyes, plant materials, fungi and lichens. 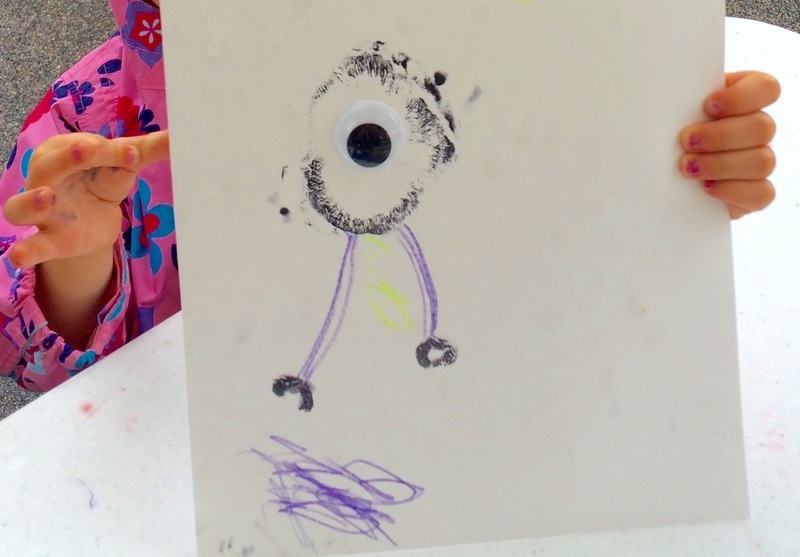 Like the little mushroom spores traveling far from where they were born, our kid-made art dried in the sun and made its way back to the artists’ homes- with a story to tell about why mushrooms have gills and how some fungal spores travel the world.